I bought my Chie Mahara shoes from Anthropologie last year and since then, I’ve been receiving their catalog each month. Each issue is a keeper filled with tons of great ideas and things to covet. My favourite top right now is the one above with the cascading ruffle down the side. I can’t decide if I want them to come to Canada, it might be too dangerous for me. p.s. I should also mention that west elm just opened on King Street West at 109 Atlantic Avenue. It’s a huge store and I love the location. I’m putting their grey organic cotton sheets on my christmas list. 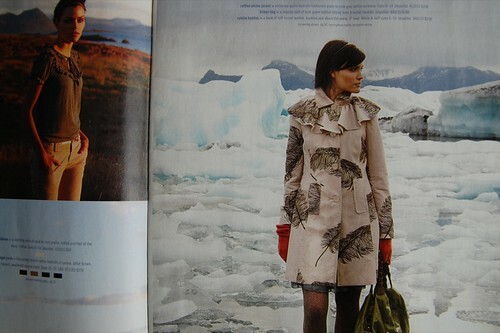 That coat with the feathers on it is to die for! oooo! 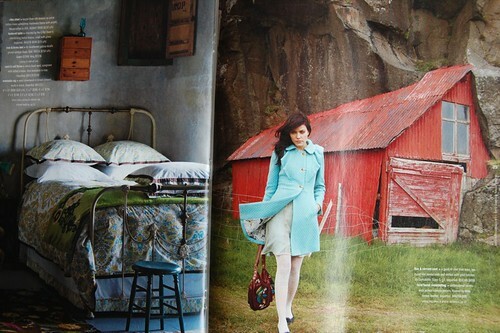 I LOOOOVE anthropologie, although I’ve never seen their catalogue. Did they send it to you you because you ordered by mail? I’ve shopped there in person and have never received the catalogue. Their store displays are always pretty amazing and apartment therapy often features the more innovative ones. The backgrounds of the photo shoots above are pretty stellar. Do you think they were ‘shopped in? I’m not sure we’d all look so glamorous in front of a dilapited red barn or pile of icebergs, but somehow it just works here! I visited anthropologie in MYC last spring for the first time and I could have moved right in a spent the entire weekend there. I felt so at home. My daughter said to me ” mom it looks like you disigned some of this stuff” . Best compliment ever from a teenage daughter . heather – i love the frilly top on the feather coat. i’d love to make a coat like that. 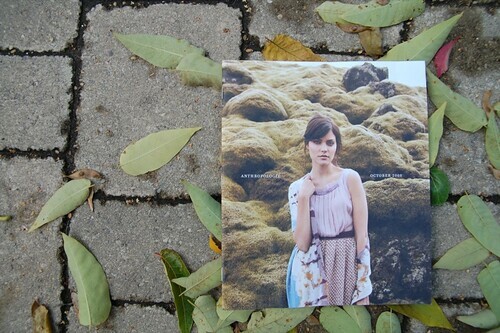 angelune – i tried for a long time to get the anthropologie catalog in the mail, but they would never send it to me. when i bought my shoes off their website and had them delivered the catalogs started arriving. what a great purchase that turned out to be! they definitely went to iceland to do this photo shoot. it’s the real deal. margie – how cute! i do love visiting their store because it’s so well merchandised and homey. i especially love all the big fluffy beds filled with pillows.